How's that for a lineup. Not to shabby! 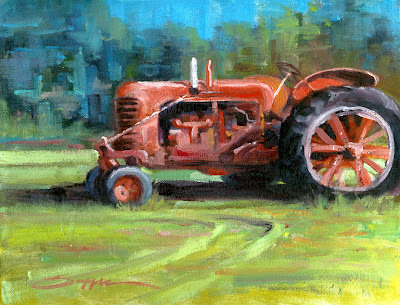 "Tractor at Nash Farm" was my exchange painting and I'm happy to report it changed hands a couple times. "MERRY CHRISTMAS"! Thank you to everyone that follows my Blog and everyone that takes the time to create a Blog to share. I'm looking forward to a great 2010. Hi Randy - Hope you had a great Christmas - the gift exchange sounds like a great treat. Wishing you a healty, prosperous and happy new year.